Abundant sunshine. High 86F. Winds W at 10 to 15 mph..
Mostly clear. Low 67F. Winds ENE at 10 to 15 mph. 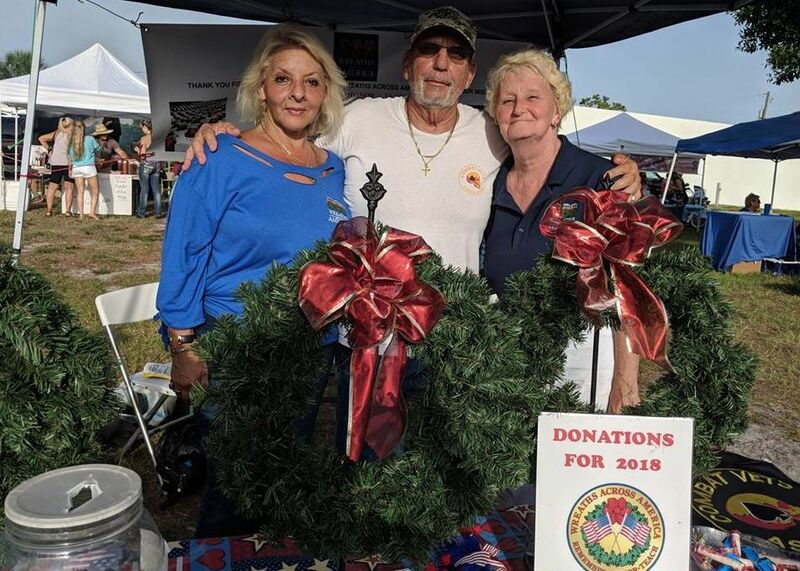 During Bike Night in 2018, sponsored by the Moose Riders and Bert’s Black Widow Harley-Davidson, volunteers with Wreaths Across America collected donations for wreaths to be laid of veterans grave sites at Gulf Pines Memorial Park in Englewood. Left: Some pet owners dressed their dogs up for Bike Nights in Englewood. 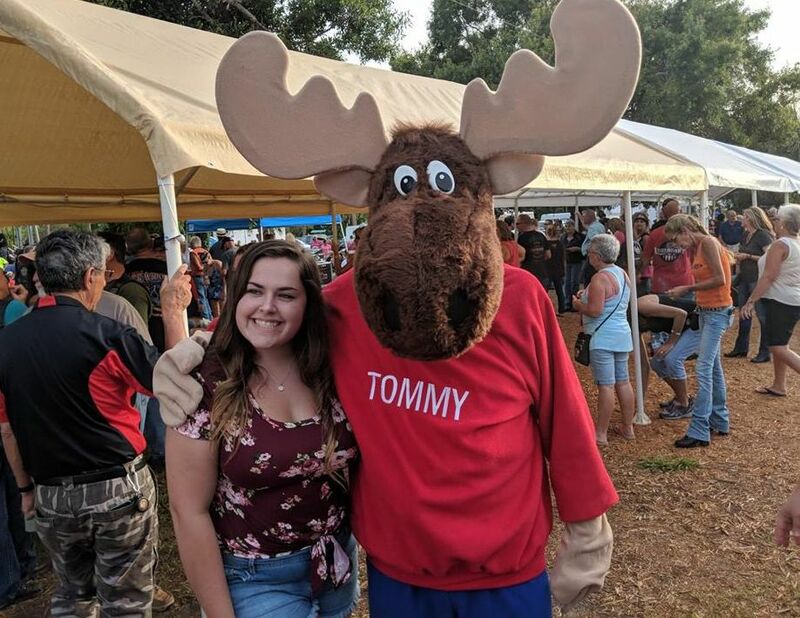 Children, teens and mascots were spotted at Bike Nights in 2018. Motorcycles back tires lined the sidewalk making a clear path to Bike Night on Dearborn Street. Some pet owners dressed their dogs up for Bike Nights in Englewood. Longtime resident Martha Halas, left, dances as the band plays at a 2018 Bike Night. ENGLEWOOD — Nancy Stayrook wants to know why she’s invited to after-hours parties to shop and sip wine on West Dearborn Street — but not welcome to enjoy concerts and a cold beer in the park during Bike Night fundraisers. Stayrook is a member of the Moose Riders 1933, a social and civic group for Loyal Order of Moose members. Starting last year, the club partnered with Bert’s Black Widow Harley-Davidson dealership for Bike Nights at Sarasota County’s Pioneer Park on West Dearborn Street. These events feature rock and country bands, plus food and beer and merchandise vendors, some of which are run by veterans groups and other nonprofits. While non-bikers are welcome and plenty attend, the event is aimed at motorcycle enthusiasts, and hundreds will often turn out. Moose Riders donate proceeds to numerous charities, including the nonprofit Friends for the Advancement of Musical Education, which raises money to buy instruments and equipment for school music programs. F.A.M.E held its own one-day, two-night Music City fundraising concert in November at Pioneer Park. Stayrook and her husband Bob, the Moose Riders’ vice president, are concerned about their future at the park, in light of critical comments Joyce Colmar made at the December board meeting of the Englewood Community Redevelopment Area. The CRA board is Sarasota County’s advisory committee that oversees and encourages economic development and activities in and around West Dearborn Street. Colmar is an attorney who owns Vino Loco restaurant and wine shop across Dearborn Street from Pioneer Park. Colmar said Bike Nights and the F.A.M.E. Music City festival have grown too big for the small park and now businesses and homeowners are negatively impacted by these festivities. Colmar complained alcohol is served with “little supervision,” the bands play loudly and the events create “excessive noise, public intoxication and underage drinking.” She said the Bike Night and the F.A.M.E. concert should find another home. The Stayrooks disagree with Colmar’s claims. The couple said they cleaned the park and outside the adjoining businesses after the Moose Rider fundraisers. “We were there well after midnight and the next morning making sure everything was cleaned after the Bike Nights,” Nancy said. She doesn’t understand the difference between drinking at Bike Nights, or at the West Dearborn Street business monthly After Hours events, when retailers stay open later and offer wine, beer, snacks and entertainment to shoppers. The Moose Riders moved their Bike Night a few blocks south of West Dearborn Street to the Englewood Shopping Center for a few months last summer when Pioneer Park wasn’t available. Coleman said the county ordinance doesn’t allow for renting a facility like Pioneer Park monthly. Instead it’s every three months. It’s one reason the Moose Riders preferred using the park on Dearborn Street. On Monday, the CRA board meets 1 p.m. at Lemon Bay Park, 570 Bay Park Blvd., Englewood. The Moose Riders are on the agenda, asking the CRA for a $1,000 grant for a March 16 music festival at the park. The meeting is open to the public. Les Bernstein, owner of Rehab on Dearborn, a vintage goods and antique shop, was with the Moose Riders before and after their events. “The park and parking area was left in really good shape,” said Bernstein, whose retail store is near the park on the same side of West Dearborn. Moose Riders president Norm Coleman said the group is responsible for holding orderly events. “We absolutely don’t have drunks walking around, damaging property and wrecking our events,” he said. “There hasn’t been any arrests. The Englewood Community Area board meets at 1 p.m. Monday at Lemon Bay Park, 570 Bay Park Blvd., Englewood. The meeting is open to the public.